mwe3: Even though were about a month away from winter, I guess its never too early to start getting into Christmas music again. What was your prime motivation for wanting to record and release a Christmas album? 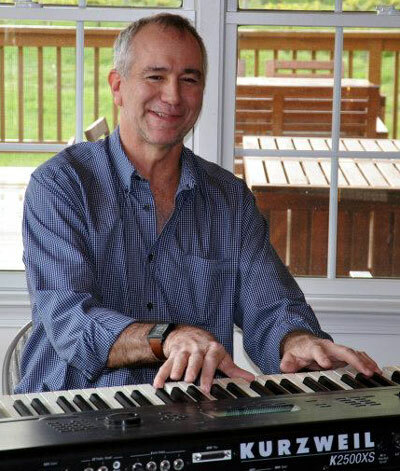 Dan Chadburn: First off, thank you for the opportunity to talk with you again, Robert, as well as the readers at mwe3.com I appreciated the dialogue we had about Nocturnes earlier this year, so it's great to visit with you again about my new CD, Whispers the Falling Snow. As for the motivation of the album, I wanted the music to serve as a reflection and celebration of wintertime and all the imagery and emotions that go with that season. And while there are indeed some longtime favorite Christmas carols on the CD, there are other songs which have been associated with the winter solstice season for many generations. I appreciate all the traditions and religious occasions going back to the earliest times of honoring the Winter Solstice. No matter how people choose to enjoy their time together during the winter, I applaud the sentiments. I wanted to try to capture some of those feelings with my music. mwe3: Can you provide a little background on Whispers The Falling Snow CD? How many tracks did you have on the list to possibly include on the CD? Considering you were recording a solo piano album, were there parameters as to decide which tracks you wanted on the Whispers album? I was so glad you picked several lesser known holiday season tracks to interpret for solo piano. Dan Chadburn: Of all my albums, this one actually had the least amount of planning before going into the studio to record. I knew I wanted it to be an acoustic solo piano album and, given my love for improvisation, we decided to keep it entirely organic. Having sung or played the melodies of traditional holiday carols all my life, I sat down at the piano in the studio with a written list of traditional carols, some more obscure than others, and then improvised off those songs' melodic themes. As we recorded each track, we also took note of its key center, so as to have a variety of keys represented throughout the album. In addition to these "traditional carol" tracks, I also composed/recorded three original improvisations in the studio to complete the album. mwe3: What piano or pianos did you record the Whispers CD with and who else was in the planning and recording of the CD? Also the front cover is great, can you tell us about the Whispers front cover art? 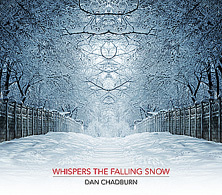 Dan Chadburn: Whispers The Falling Snow was recorded at Bias Studios in Springfield, Virginia. Jim Robeson and my husband, Tom Nichols, were the recording engineers for the album. I actually recorded my first two albums at Bias (Solo Piano and Reflections) several years ago, so it was great for Tom and me to return to Bias and work with Jim again on this project. mwe3: Its interesting that you chose to record some lesser known tracks on the Whispers CD. For example, the lead off track O Come, O Come Emmanuel is fairly unknown. Where did that track come from and what did you set out to do with the song musically speaking? Dan Chadburn: The melody of this track actually has its origins in 15th-century Franceas documented by British musicologist Mary Berry in 1966. For whatever reason, I'm drawn to music centered in minor modes. I love the sense of mystery it evokes. I chose this song as the opening track on the CD because I believe it represents that sense of mystery while also quietly heralding the peaceful beauty of the winter season. mwe3: Track two on the Whispers CD is another lesser known track called Bring A Torch, Jeanette Isabella. The melody sounds familiar but again, its a fairly lesser known track. I read its actually originally from France written in 1553 and its in 3/8 time? So that one goes back a long time. Beautiful melody too. How did you approach that track for solo piano? 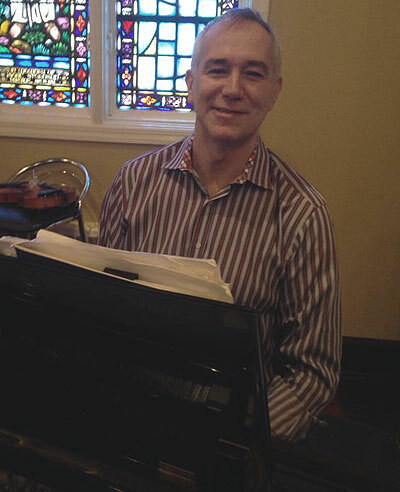 Dan Chadburn: Yes, indeed, it's another centuries-old melody whose origin is from France. While it has evolved over many generations into a melody associated with the winter solstice season, it was originally composed as dance music for french nobilityhence, its 3/8 meter. Winter, with its reduced hours of sunlight, can be dark and somber for some. I wanted the imagery and pulse of this track to be that of bringing light and hope into the darkness. 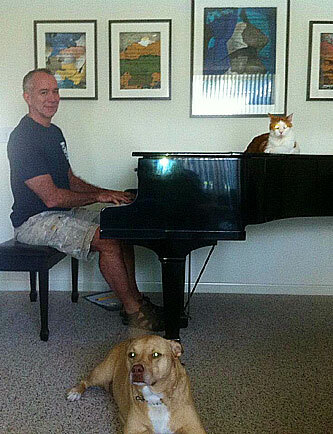 mwe3: Returning Home is a Dan Chadburn original that fits in nicely with the other songs. Was the song written for this album? Is the song autobiographical in a way? Returning Home is kind of a very spiritual title. Is there a way to go back home again? 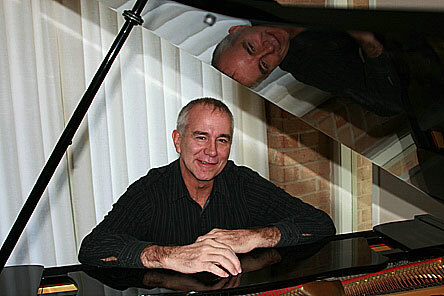 Dan Chadburn: "Returning Home" is one of the three original improvisations on the album which is not based on a traditional carol melody ("Winter Waltz" and the title track, "Whispers The Falling Snow," are the other two). It's hard to describe my process of improvisation. Simply put, I close my eyes, place my hands on the keys of the piano...and then "let it go..." Never quite knowing what my hands will play but trusting in the moment, allowing them to create whatever song it is they have to share. As I recorded "Returning Home," I thought about returning to my childhood home for the first time, many years ago now, to visit my parents and family over the holidays, after having moved thousands of miles away to begin life as an adult. The emotion I felt was that of excitement, though with a slight hint of hesitation too. I'm hoping people will be able to experience their own "Returning Home" memory when listening to this piece. mwe3: Your inclusion of Silent Night goes back to the essence of the whole Christmas season in a way. But theres a lot of improvisation in your version, especially with the minor key intro. Only after 2 minutes does the original melody appear. Another interesting song in 6/8 time. Interesting to note that the song was first played on Christmas Eve in 1818. What does Silent Night mean to you on a musical / spiritual level? Dan Chadburn: Yes, the melody, and guitar accompaniment), for "Silent Night" was composed by Franz Gruber and first performed on Christmas Eve 1818 in a small church in Austria. For me personally, few traditional carols represent the essence of Christmas more than "Silent Night." mwe3: In The Bleak Midwinter is an unusual song. Was the music really written by Gustav Holst? Is there another version of this track that inspired you to want to include it on your album? What does the song bring to mind to you and when did you first hear it? Dan Chadburn: This melody was, indeed, written by Gustav Holst in 1906. The text, when sung, was penned by Christina Rossetti in 1872. I first heard this carol when it was played beautifully on the piano by a marvelous jazz pianist and friend of mine named Katherine Chrishon. I remembering thinking at the time, that it has such a nice, singable folksong-like melody... why the gloomy title? Putting the "Bleak" title and lyrics completely aside, I decided instead to focus on the simple beauty of the musical phrases while recording this piece. mwe3: What Child Is This, track six on Whispers The Falling Snow is actually better known as Greensleeves. The song was written in 1865? As many versions as there are, its always worth hearing it again. What about this track means so much to you and why do you think its remained so popular over the years? Do you have other favorite versions? I always thought Greensleeves worked best as an instrumental for some reason, as your version proves. Dan Chadburn: The tune, "Greensleeves," is actually an English ballad which dates back to the 16th century. Today, the tune is most often associated with the traditional carol text, "What Child Is This," which, as you said, was written in 1865 by William Chatterton Dix and published in 1871in a collection titled "Christmas Carols New And Old". Interestingly, many of the texts first associated with the tune were secular in nature, having nothing to do with Christmas. There are, indeed, many versions of "Greensleeves." Perhaps the first time I heard the tune was as a young boy, watching the show, Lassie on television. A rendition of "Greensleeves" was used during the credits in the last couple seasons of the show. I've always enjoyed the shape of the tune's musical line, and the fact that it is in a minor mode. For that reason, I decided to include this instrumental version on the album. mwe3: Winter Waltz, track 7 is another Chadburn original. Is there a history with that track you can share? It seems upbeat in contrast to some of the other deeper kind of songs. Is that the waltz time that gives Winter Waltz a kind of upbeat sound? mwe3: Away In A Manger is another lesser known track. Interesting to note that the song is so popular in England yet here in the US its fairly unknown by comparison. Can you tell us something interesting about Away In A Manger, when you first heard it and how it fits in with the other tracks on the Whispers The Falling Snow album? Dan Chadburn: Indeed, in Great Britain, "Away In A Manger" is among the most popular Christmas carols of all time, dating back to its original publication in the late 1800s. There are several tunes associated with the text. I decided to use melodic themes from two of theseone written by James Murray in 1887 and the other by William James Kirkpatrick in 1895as a medley for the track on the CD. My intent was to capture the feeling of this piece as a lullaby. Indeed, I probably heard the tune for the first time myself as a very young boy. mwe3: Angels We Have Heard On High has to be one of the most beautiful Christmas season songs ever. Plus it has one of the classic chord progressions which kind of sounds like it inspired progressive rock in a way. Im sure Rick Wakeman and Gary Brooker incorporated some of those progressive chord changes in their early music. Any special significance of the Angels song to you? 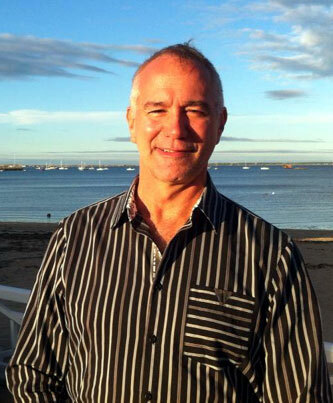 Dan Chadburn: Similar to you, I've always liked the melody and chord structure of this carol. The source of the music is an old French carol, later arranged by Edward Shippen Barnes, in 1937, into the common heard carol today. As you mentioned, one can't help but wonder if progressive greats from bands like YES and Procol Harum incorporated some of these same chord progressions in their music. While the progressions are long established, they seem timeless to me. We recorded several different improvisations on "Angels We Have Heard on High" and ultimately decided upon this one for the album. mwe3: The title track closes Whispers The Falling Snow. Is the song a kind of reverie? What made you want to close the album with the title track? Its a great reflective track that really fits well on the CD. It doesnt snow as much as it used to but I guess it will start soon! What are you hoping that the listeners will feel like after playing this CD? Its such a peaceful kind of album and in this turbulent world it cant hurt to have a musically calming moment that lowers the blood pressure and takes us back to where weve been and where were going. mwe3: Are you always writing music and what other avenues would you like to go down next musically? 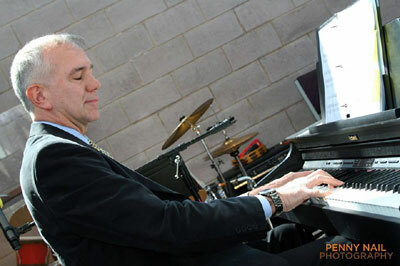 Any future plans for the fans and readers to hear about regarding your next musical moves? 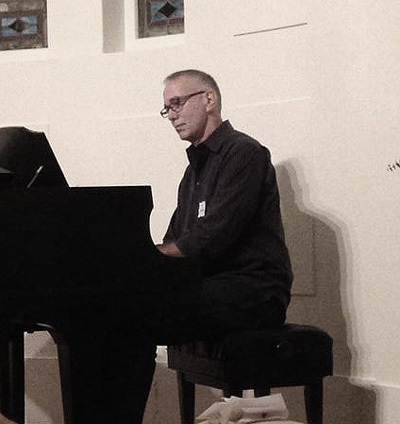 Dan Chadburn: I got back into the studio about three weeks ago and began laying down some new improvisations, which I'll use as the foundation in writing some orchestral/instrumental tracks over the next couple months. Right now, I envision the textures of the new album to be slightly more complex than my previous stuff, but more similar to the tracks on Reflections and Nocturnes than Solo Piano or Whispers The Falling Snow. Thanks again, Robert, for the opportunity to chat and talk about Whispers. I appreciate it very much!